Mission: Established in 2008, Fogo Island Arts is located off the coast of Newfoundland in Canada. With the opening of the Fogo Island Inn in 2013, Fogo Island Arts will enter a new phase of its evolution, expanding its program to include exhibitions at the Inn, publications produced in collaboration with international imprints, and partnerships with public institutions globally. These initiatives are part of a social enterprise-based business model that will support the economic viability of the Fogo Island Inn and the growth of tourism on Fogo Island. The programs at Fogo Island Arts provide alternatives to more traditional international residencies and public art galleries in North America — in part due to the resourcefulness and creativity of Fogo Islanders, which provides a vital framework for the organization’s activities. Critical engagement with the residents of Fogo Island forms the core of our programs. This means we design our educational projects and public events with both local and international audiences in mind. The past years have already shown Fogo Island Arts to be a springboard, launching the professional careers of many artists and curators. We are recognized globally as a leading-edge contemporary art institution, providing support for artistic exploration and production. Fogo Island Arts works to create meaningful partnerships — locally, nationally and internationally. Collaboration enhances knowledge through the sharing of resources, strengthening capacities and stimulating creative thought. By facilitating collaborations between emerging and established artists, curators, scholars and the public at large, we are building a growing national and international network of associates that help to support the institute and its programs. Cost: Artists/curators/filmmakers selected to the program can apply for stipend to cover material and living costs on the island and for travel (to and from Fogo Island only). Production funding can also be applied for during residency on the island. Accommodations: All participants in our Residency Program live in heritage houses; four off-the-grid studios designed by architect Todd Saunders are made available to artists-in-residence who have a studio-based practice. Situated at different locations around the island, the studios and artists’ homes help connect participants in our programs with the day-to-day lives of the Island’s local communities. Medium: curators, artists, designers and art educators engaged in community-based practices that are sensitive to context. Conferences: Engaging critics, curators, artists and theorists, the Fogo Island Dialogues will be organized in collaboration with other institutions and will take place on Fogo Island and in other locations, such as St. John’s, Montreal and Vienna. The dialogue/lecture format will provide opportunities to address issues related to the cultural, economic and ecological survival of rural communities, while sharing our work with national and international audiences. Exhibitions: Solo exhibitions at the Fogo Island Gallery (housed in the Fogo Island Inn) will present work by artists participating in the Fogo Island Arts international residency program. Inaugural exhibitions will present work by Kate Newby (New Zealand); Kevin Schmidt (Canada); and Zin Taylor (Canada). Publications: Fogo Island Arts will make publications to accompany exhibitions presented in the Fogo Island Gallery and as a complement to the Fogo Island Dialogues. Ideally, most publications will be produced in partnership with other institutions and publishers. 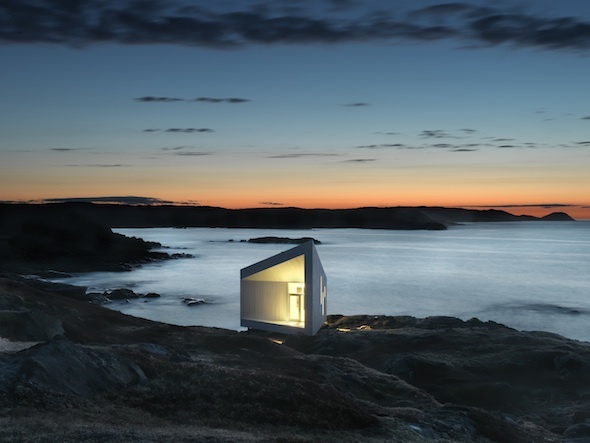 Cinema: Formerly known as the Film House, the Fogo Island Cinema will present screenings of national and international films as part of Shorefast Foundation and Fogo Island Arts programs. Presentations of NFB Fogo Process films will be accompanied by discussions and related events. Education: Fogo Island Arts presents art and filmmaking workshops for elementary and high school students attending Fogo Island Central Academy. Workshops for adults and specific community groups will also be offered. Deadline: For its 2013–14 residencies, Fogo Island Arts is seeking proposals for projects to be produced within the organization’s Education Program. Applications are accepted by regular mail only, and should be postmarked no later than May 31st, 2013, for residencies starting September 1st, 2013. Posted in Canada, Fogo Island Arts ResidencyTagged 3 months, 6 months, alternatives, art educator, art residency, Artist, Artist Residency, artists, audience, Canada, communities, community-based practice, conferences, Contemporary Art, cover material, creativity, critical engagement, critics, cultural, curator, curators, design, designer, designers, ecological, economic, economic viability, education, Education Program, educational projects, elementary, Emerging, established, exhibitions, exploration, Film House, Fogo Island, Fogo Island Arts, Fogo Island Arts Residency, Fogo Island Inn, global, heritage houses, high school, Inn, institution, International, international imprints, international residency, issues, Labrador, local, local community, mail delivery, May 31, Montreal, national, Newfoundland, NFB Fogo Process, North America, off-the-grid, production, Project proposal, public, public art, public art galleries, public events, public institutions, publication, publications, Rate My Artist Residency, regular mail only, residencies, residency, resourcefulness, rural, scholars, Shorefast Foundation, six months, social enterprise-based business model, solo exhibition, St. Johns, Stipend, stipend living cost, studio-based practice, survival, theorists, three months, Todd Saunders, tourism, traditional, travel, travel stipend, Vienna, workshop, workshopsBookmark the permalink.